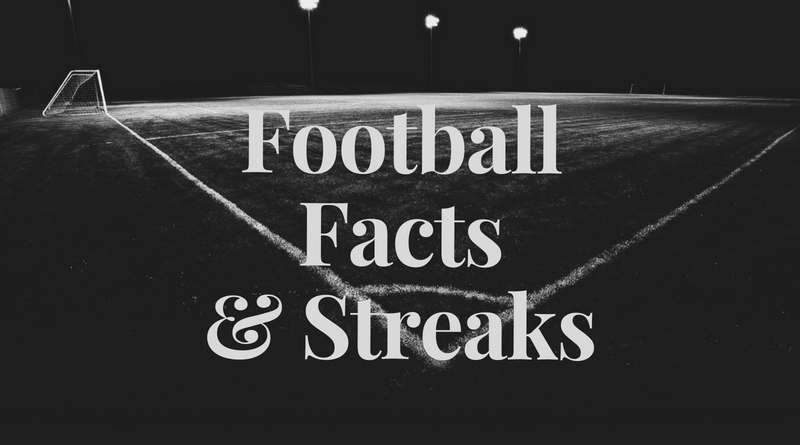 Frosinone have lost their last 5 matches in Serie A.
Frosinone have failed to win in their last 7 matches in Serie A.
Frosinone have conceded 2 goals or more in each of their last 4 matches in Serie A. Real Sociedad scored in last 7 away games in La Liga. Nice has over 2.5 goals in their last 3 games in Ligue 1. Toulouse scored in last 9 home games in Ligue 1. Toulouse scored in last 3 games in Ligue 1. Nice allowed opponents to score over 1.5 goals in last 5 away games in Ligue 1. NAC Breda have lost their last 5 matches in Eredivisie. NAC Breda have conceded 2 goals or more in each of their last 5 matches in Eredivisie. Shandong L. conceded at least 1 goal in each of their last 7 home matches in Super League. Tianjin Quanjia have scored in 82% of their away matches in Super League. Henan Jianye conceded at least 1 goal in 92% of their away matches in Super League. Shandong L. have scored in 91% of their home matches in Super League. Henan Jianye have lost 67% of their away matches in Super League. Shandong L. conceded at least 1 goal in 73% of their home matches in Super League. Henan Jianye have lost their last 4 away matches in Super League. Shandong L. have scored in each of their last 15 matches in Super League. Shandong L. conceded at least 1 goal in each of their last 7 matches in Super League. 81% of SonderjyskE’s conceded goals were conceded away in Superligaen. 31% of SonderjyskE’s conceded goals occurred after the 75th minute in Superligaen. 82% of Vejle BK’s matches had under 2.5 goals in Superligaen. 31% of Vejle BK’s conceded goals occurred after the 75th minute in Superligaen. Red Star have conceded the opening goal in 78% of their matches in Ligue 2. 100% of Le Havre’s conceded goals occured in the second half in Ligue 2. Clermont did not concede any goal in their last 3 away matches in Ligue 2. Grenoble have conceded 2 goals or more in each of their last 3 matches in Ligue 2. Red Star have conceded 2 goals or more in each of their last 4 matches in Ligue 2. Clermont have been undefeated in their last 6 matches in Ligue 2. 71% of Red Star’s goals have been scored in the second half in Ligue 2. Red Star were losing at halftime in 56% of their matches in Ligue 2. Red Star have lost 78% of their matches in Ligue 2. Orleans were losing at halftime in 56% of their matches in Ligue 2. 67% of Niort’s matches had under 2.5 goals in Ligue 2. 78% of Paris FC’s matches had under 2.5 goals in Ligue 2. 86% of Paris FC’s conceded goals were conceded away in Ligue 2. 50% of Clermont’s conceded goals occurred after the 75th minute in Ligue 2. Red Star have lost their last 4 matches in Ligue 2. 29% of Paris FC’s conceded goals occurred in the first 15 minutes in Ligue 2. 78% of Chateauroux’s matches had under 2.5 goals in Ligue 2. 89% of Troyes’s matches had under 2.5 goals in Ligue 2. Troyes have scored 67% of their goals in the first half in Ligue 2. 71% of AC Ajaccio’s goals have been scored in the second half in Ligue 2. 67% of Troyes’s conceded goals occured in the first half in Ligue 2. Troyes were losing at halftime in 56% of their matches in Ligue 2. Troyes have scored 50% of their goals in the first 15 minutes in Ligue 2. 89% of Le Havre’s matches had under 2.5 goals in Ligue 2. Le Havre have scored 62% of their goals in the first half in Ligue 2. 50% of Le Havre’s conceded goals occurred after the 75th minute in Ligue 2. Red Star have scored 43% of their goals after the 75th minute in Ligue 2. 67% of AC Ajaccio’s matches had under 2.5 goals in Ligue 2. Béziers have failed to win in their last 6 matches in Ligue 2. 89% of Béziers’s matches had under 2.5 goals in Ligue 2. 33% of Béziers’s conceded goals occurred after the 75th minute in Ligue 2. Darmstadt have conceded 2 goals or more in each of their last 3 matches in II Bundesliga. Hamburger SV did not concede any goal in their last 3 away matches in II Bundesliga. Ostersunds have scored in each of their last 17 matches in Allsvenskan. Ostersunds conceded at least 1 goal in 75% of their home matches in Allsvenskan. Dalkurd have lost 67% of their away matches in Allsvenskan. Kasimpasa have scored in each of their last 7 matches in Super Lig. Kasimpasa have conceded 2 goals or more in each of their last 3 matches in Super Lig. Goztepe have scored 2 goals or more in each of their last 3 matches in Super Lig.